Recovering attorney fees is not an easy feat in a lawsuit, especially when defending a case. Here in the U.S., we go by the “American Rule” to determine who pays for legal fees. Under this rule, with the exception of contracts between the parties and statutes providing for the recovery of attorney fees, each party is responsible for its own fees, regardless of who wins the lawsuit. The alternative to this, the “English Rule,” which is used in most other countries, provides that the prevailing party in a lawsuit has its attorney fees paid for by the opposing party. The logic behind the American Rule is to encourage people to seek redress from wrongs and not be discouraged by the threat of having to pay a defendant’s attorney fees if they lose. The English Rule, which I personally prefer, tends to discourage parties from continuing on with litigation – either as a plaintiff or defendant – when they are not confident that they will prevail. In essence, the English Rule discourages questionable litigation, while the American Rule does not penalize it. any other compensatory damages that may be proven. In this case, I represented an insulating contractor and its owner facing four separate claims, one of which was a civil theft claim. Through hard work, thoughtfulness, and the plaintiff’s risky claim, I obtained a complete defense verdict in a jury trial. After trial, I then represented my clients in two appeals of the civil theft claim. Although the Court ruled in my clients’ favor, the Court did not initially award attorney fees to them. That did not discourage me or my clients from prosecuting the appeal – mostly because we knew that we would eventually be awarded our fees. 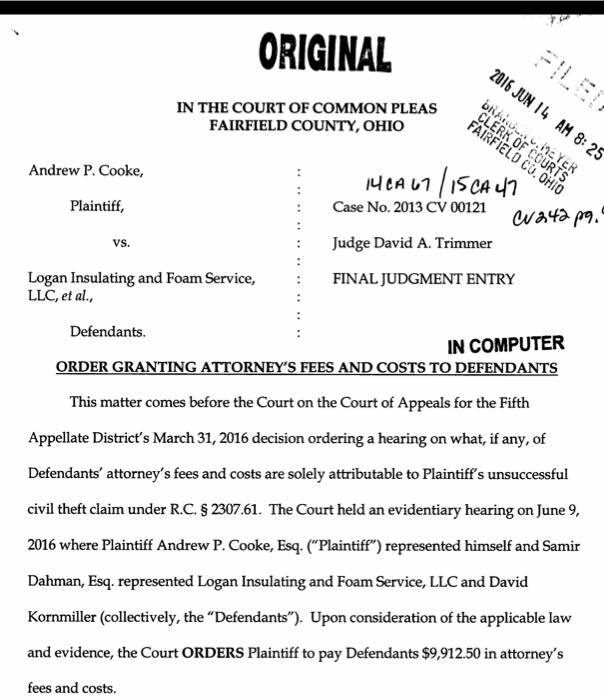 Ultimately, after a hearing on our attorney fees, the Court ordered the Plaintiff to pay our attorney fees associated with the civil theft claim. So not only did I successfully defend his clients, I also saved them thousands of dollars in attorney fees, an accomplishment that is extremely difficult under the American Rule. This demonstrates that the American Rule can provide fair and just results for defendants through thorough and diligent representation.